Federal employees in the Washington, D.C., region are increasingly turning to unemployment benefits for a quick injection of cash, despite the likelihood that they will have to return the money once the government reopens. About 9,000 feds in Washington, Maryland and Virginia have filed unemployment claims, a right afforded to all furloughed employees during the shutdown. The number of feds in the capital region requesting unemployment has increased nearly 10-fold since the shutdown’s second week. 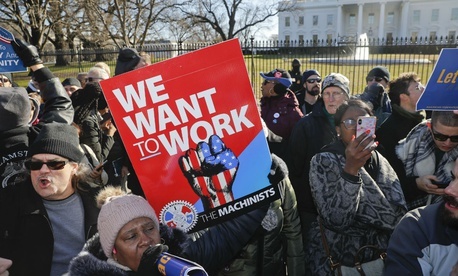 The dramatic uptick demonstrates the pains furloughed federal workers are feeling during the partial shutdown, which dragged into its 25th day on Tuesday and forced affected employees to miss paychecks for the first time last week. More than 5,200 federal employees had filed applications for unemployment in Washington as of Friday, with an additional 1,200 contractors also submitting claims. Nearly 3,000 feds in Maryland had applied for unemployment benefits as of Friday. An additional 608 workers in Virginia have filed claims, a dramatic increase from the two-dozen who applied two weeks into the shutdown. During the 16-day shutdown in 2013, more than 40,000 federal employees in Washington, D.C., Maryland and Virginia alone filed for unemployment benefits. In the first three days of the shutdown, that total had already topped 10,000. The reduction in applications is likely due to a confluence of factors. In 2013, more than 850,000 federal employees were furloughed after every agency was forced to close its doors. In the current partial shutdown, the number is closer to 350,000. Still, fewer employees are making claims than would be expected if they were applying at the same rate as they did five years ago. Every federal employee still receives information on applying for unemployment when they receive their furlough notice. After the government reopened in 2013, most states demanded that feds repay their benefits because they received back pay. Some states did not institute the requirement, but the Labor Department eventually issued a nationwide mandate that the benefits must be repaid. State agencies this time around are warning employees when they file initial claims that anyone who receives back pay will have to repay what they take in. Both chambers of Congress have already passed legislation to ensure furloughed feds receive back pay and Trump has vowed to sign the measure. Still, thousands of federal employees have determined that, facing the reality of missed pay, the temporary cash infusion is worth the hassle. In Maryland, the maximum weekly benefit is $430. In Washington the weekly cap is $425 and in Virginia it is $378 per week. Excepted and exempted feds working through the shutdown without pay until agencies reopen are not eligible to apply for unemployment.